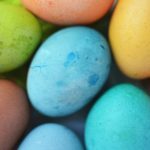 Do you have tips for egg safety during Easter Egg Hunts? After you have safely dyed and decorated your Easter eggs, it’s time to hide them! Eggs must be carefully placed, if you plan to eat them afterwards. The Egg Safety Center does not recommend hiding eggs on chemically treated lawns, potted plants, window sills, or in or near pet housing. Contaminants from those locations adhere to the shell of the egg and make it impossible to avoid cross-contamination. Easter egg hunts should not exceed two hours. Hard-boiled eggs have a short window for consumption when not properly refrigerated (at 45 degrees Fahrenheit). Try setting a timer and examine all eggs before allowing your children to eat them. If any of the eggs have cracks, discard them immediately. Eggs-xtra Tip: Provide a protein snack, like hard-boiled eggs, before the festivities to prevent overeating of Easter goodies.